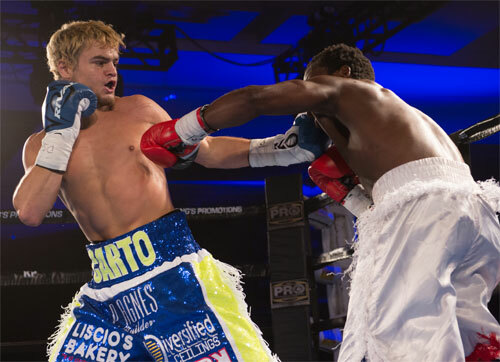 Rising local bantamweight slugger Christian Carto extended his perfect ring record to eleven straight and kept his knockout streak going (11-0, 11 KOs), in a scheduled six rounder at the Sugar House Casino in Philadelphia. 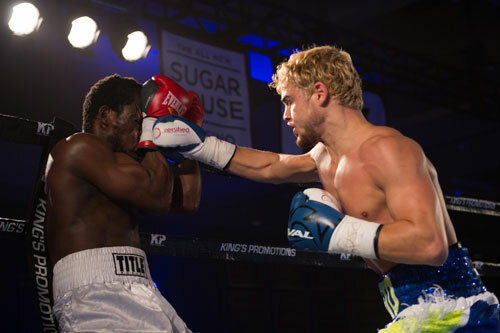 The fight was the main event of a ten-bout show promoted by Marshall Kauffman’s King Promotions. 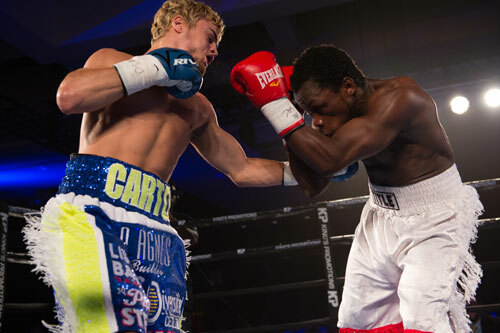 Carto faced St. Paul’s Philip Adyaka, and handled the somewhat soft touch with ease. After warming up and controlling round one, Carto came out for the second in high gear, looking to add another knockout to his collection. After tagging Adyaka a few times with a steady jab, the rising star turned up the heat and began landing with authority. Carto blasted away, landing almost everything he threw. He continued to batter Adyaka until referee Gary Rosato finally stepped in to stop it. Some thought the bout had ended too quickly, but it was very clear that the visitor would be heading home soon regardless. The end of Carto’s first-ever main event came at 2:43 of the second round. Carto continues to impress and looks like a truly hot prospect. The loss left Adyaka 7-9, 4 KOs. 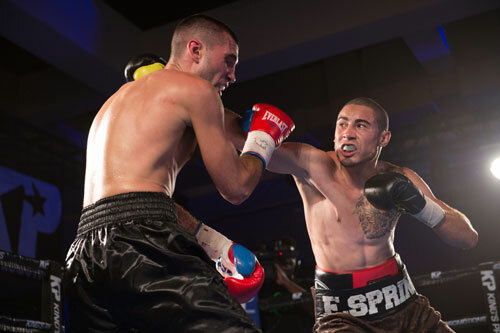 In the co-feature fight, Reading, PA junior middleweight Erik Spring, 10-1-2, 2 KOs, started slowly, but rallied to pull out a six round majority decision against David Wilson, 5-1-1, 1 KO, of New Haven, CT. Wilson won the first two rounds on my card before Spring woke up and began edging out the rounds that followed. From my perspective, Spring strung together the final four rounds to earn the win, 58-56 on my tally. The official scores the same by George Hill and John Poturaj (58-56), while judge Dewey Larossa called the contest a draw (57-57). 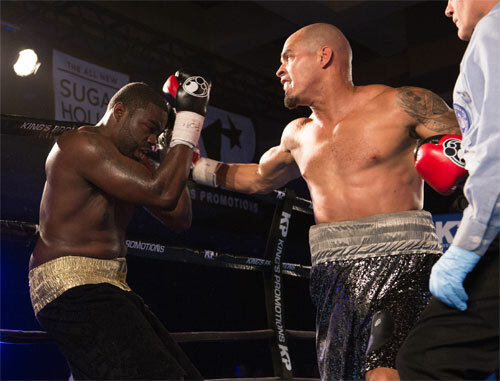 In a scheduled six round cruiserweight bout, Elvin Sanchez, 8-3-1, 6 KOs, Paterson, NJ, stopped Philly's Khalib Whitmore, 6-2, 5 KOs, in round two. Whitmore appeared to take the first round, but things turned quickly after Sanchez slammed home a left hook that sent Khalib crashing to the canvas. Whitmore climbed to his feet, but Sanchez jumped right on him and pounded away. A left uppercut jarred Whitmore and prompted referee Gary Rosato to halt the bout at 1:54 of the second. 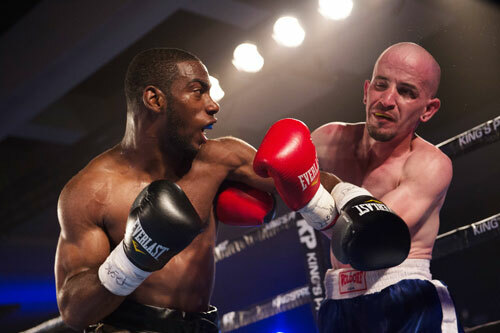 Khalib was coming back after more than two years away from the ring and suffered his second straight TKO loss. 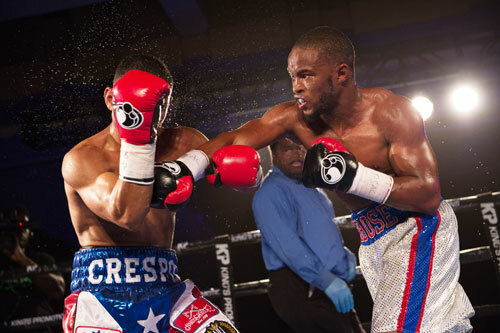 Philly junior lightweight Antonio Dubose, 9-2-1, 2 KOs, turned in a career-best performance, beating Josh Crespo, 7-5-3, 3 KOs, over six lively rounds. 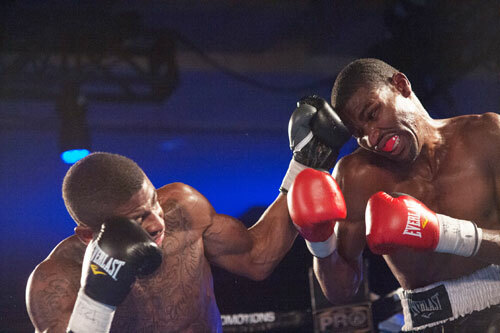 The fighters exchanged hard shots in the opening round, but DuBose took over in the second. Tony put Crespo down with a hard right-left hook in round two, and managed to keep the edge through most of the exchanges that followed. Crespo landed too, making the fight a fun ride, but DuBose was in charge until the final bell. He took the decision by official scores of 60-53 (Dewey Larossa) and 58-55 twice (Adam Friscia and John Poturaj). Crespo won round on my card, which totaled 59-54 for Dubose. Houston welterweight Marquis Taylor, 7-1, beat Philadelphia southpaw Vincent Floyd, 3-3-1, 2 KOs, by unanimous decision over six non-stop rounds. Both lanky fighters fought hard, but the Texan out worked the local and landed the more telling blows. All three judges (Friscia, Larossa and Hill) scored the bout a 60-54 shutout. 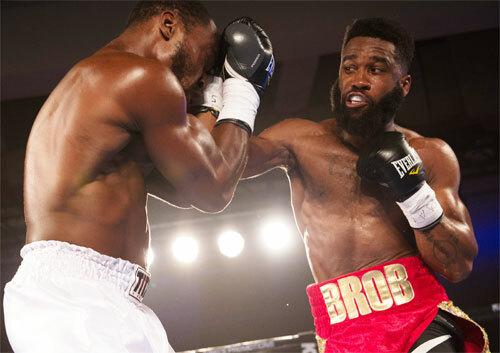 In a scheduled six round super middleweight bout, Philly's Brandon Robinson, 5-1, 4 KOs, smashed Shane Pearson, 2-2, 2 KOs, Statesville, NC, with a right hand in round two, and won by KO at 20 seconds of that round. Referee Blair Talmadge almost stepped in a moment before the final punch, but decided to let the fight continue. Robinson kept throwing punches and landed the haymaker that dropped Pearson and stopped the match without a count. Robinson looked powerful and aggressive. 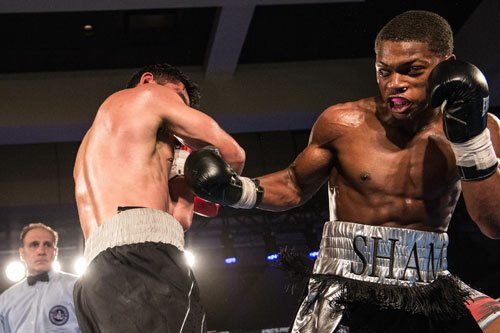 Flashy Philly junior welterweight southpaw Sham Justice, 1-0, looked impressive in his pro debut. He pounded Tito Gonslaves, 0-3, Lancaster, PA, for three full rounds and stopped him at 2:11 of round four. A star is born. Gary Rosato was the referee. 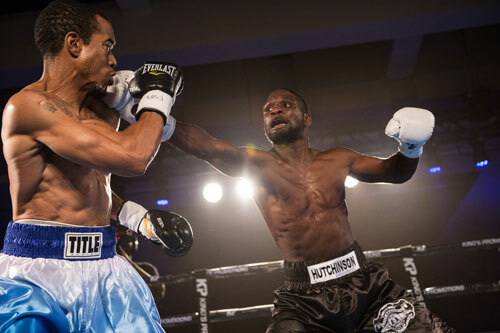 Junior welterweight southpaw Kashon Hutchinson, 3-3, 1 KO, Reading, PA, won a four round unanimous decision over Philly's Demetrius Williams, 1-3. All three scores by Dewey Larossa, John Poyuraj and Adam Friscia, were 39-37. My card was he same. Philly bantamweight Jerrod Minor, 1-0, 1 KO, made a successful debut, stopping fellow-Philadelphian Steven Lopez, 0-2, at 2:34 of round four. Minor landed many sharp punches throughout, including a strong body attack. The referee was Gary Rosato. 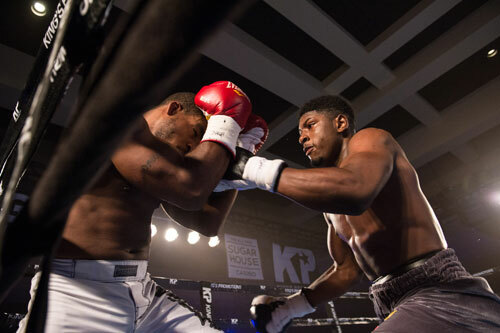 In the opening bout of the evening, Houston light heavyweight Christian Montano, 2-0, 2 KOs, dropped DC's Dameron Kirby, 0-1, three times in the opening round, and scored a first round TKO at 2:25. The referee was Blair Talmadge. The ten bout card was promoted by Marshall Kauffman's Kings Boxing.